St. Louis businessman Donald L. Bryant, Jr. acquired his 13-acre vineyard overlooking Lake Hennessey in the late 1980s, then called on top viticulturist David Abreu to replant it with 100% Cabernet Sauvignon (there had originally been vines on the property dating back to the 1950s). 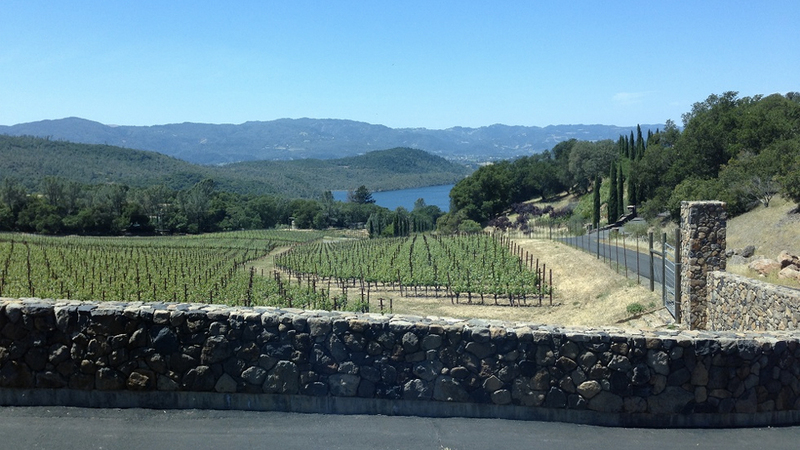 Bryant hired winemaker Helen Turley at the outset and the first vintage to be released was the 1992. Thanks to Turley’s talents and the quality and concentration of the fruit, the Bryant Family Vineyard Cabernet Sauvignon quickly became one of Napa Valley’s most fashionable and expensive cult wines. 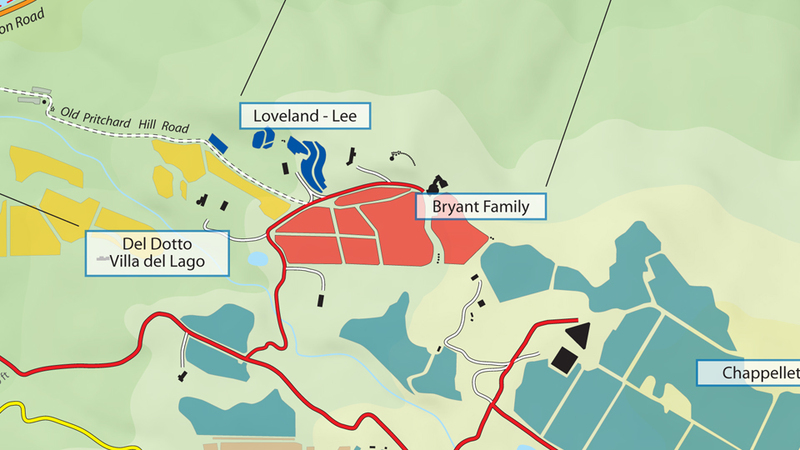 Bryant’s Pritchard Hill vineyard is located between 750 and 1,000 feet above sea level. It’s rocky and exposed, with a tilt toward the afternoon sun that makes it a very warm site (Colgin’s IX Estate, by comparison, is mostly east-facing and at slightly higher altitude.) In fact, shade cloth is used across the entire property to give the wines some relief from the hottest afternoon sunshine in mid- to late summer. According to winemaker Marc Gagnon, because many key phenolic compounds require early-season sunlight, the estate normally waits until late July (i.e., after the veraison and green-thinning) to mount the shade cloth. The Pritchard Hill property began with 100% Cabernet Sauvignon and the flagship estate Cabernet is still varietally pure. But today the property includes 5% Petit Verdot and 5% Cabernet Franc. Some of the Cabernet Franc goes into the DB4 bottling and the best of this fruit may eventually find its way into the flagship Cabernet. Bryant has employed a number of talented winemakers through the years, with famed enologist Michel Rolland providing advice and helping with the final blending since 2003. Helen Turley vinified from 1992 through 2002. Enologist/consulting winemaker Philippe Melka finished the 2001 and vinified the 2003 through 2006 vintages. Marc Aubert took over winemaking responsibilities in time for the 2007 harvest and did the final blend of the 2006 with Rolland. Aubert then vinified at Bryant Family Vineyard through 2009. There were then a succession of part-time winemakers within just a few years: Ross Wallace made the 2010, Helen Keplinger made the 2011, and Todd Alexander vinified in 2012 and 2013 (and finished the 2011). Current winemaker Marc Gagnon, who had previously been assistant winemaker at Screaming Eagle, took over in June of 2014 as Bryant’s full-time winemaker. Helen Turley carried out shorter macerations, as the early vintages were made at the Napa Wine Company custom-crush facility in Oakville. Her last vinification, in 2002, was Bryant’s first in their new winery on Pritchard Hill. But winemaker Gagnon, who vinifies the estate Cabernet in a mix of concrete vats, stainless steel tanks and oak barrels, extols the benefits of extended maceration, beginning with the fact that it gives him more tools when working with younger blocks (fruit from some young vines spends as long as 50 days on its skins). He also favors longer total time on the skins for valley-floor fruit as it’s difficult to overextract from these grapes. The older vines also get a slower extraction, lasting as long as 35 days. But the steepest hillside blocks, owing to their considerable tannic clout, can spend as little as 15 days on their skins, with little or no post-fermentation maceration. Gagnon’s goal for the temperature of the fermentation is a steady 80 degrees F. and he does not like to exceed 83. Don Bryant’s wife Bettina Bryant, who became president of the estate in 2014, told me that in the early vintages the estate aged its free-run juice in 100% new oak (Turley used virtually all Taransaud barrels) but that the final blend also usually included a bit of press wine that had been aged in a used barrel. Nowadays, Gagnon uses about 90% new oak, and after a period of years in which a blend of coopers was used, Gagnon is back to virtually 100% Taransaud barrels. “I find that they just work for the estate wine,” he told me, explaining that “our Cabernet Sauvignon here has always had a true varietal olive character and the Taransaud barrels elevate and harmonize that component.” He does a “base blend” after 12 months, still with the involvement of Michel Rolland, then typically bottles without fining or filtration during the second June or July. This very warm site makes a deep wine with intense, glossy mountain dark-fruit character and a firm yet filigreed structure. The pHs of the finished wines typically range between 3.7 and 3.9, with total acidity levels between 5.6 and 6.3 grams per liter. Alcohol levels in recent years have been consistently around 15%, although vintages like 2004, 2007 and 2008 climbed higher. (At 13% potential alcohol, the seeds would still be green, noted Gagnon.) As a general rule, the harvest here has taken between three and four weeks. Although recent vintages like 2011 and 2010 were very late (beginning on October 17 and 14, respectively), mid- to late September has been a more typical starting time. Incidentally, Gagnon told me that he is now picking a little earlier than previously. In 2014, for example, he carried out 49 “micro-picks” of the estate vineyards stretching from the end of August to early October! According to the estate’s records, the only previous year when any Cabernet was picked at the end of August was 2001. I had expected to taste a good representation of vintages, but the estate presented every vintage back to 1994, with the exception of the 1999 to 2001 trio, for which stocks are extremely short. (According to my memory, Bryant outperformed in 1999 and 2000, but its 2001, the last vintage made at Napa Wine Company, was compromised by a brett problem and was diminished by the sterile filtration that was required.) Even the oldest vintages I tasted were full of life; the intense black fruit flavors provided by the vineyard are virtually bulletproof, although what’s even more impressive about this wine is the varietal purity and complexity of the Cabernet Sauvignon, which makes a complete wine here without the addition of other varieties. 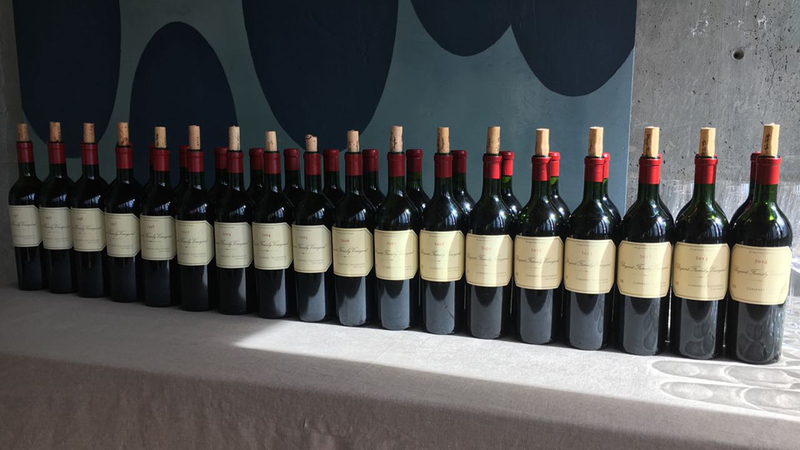 Of the many extensive vertical tastings I’ve conducted in California and elsewhere in recent years, the Bryant flagship wine stands out for the consistency of its high quality—clear proof of the supremacy of the site. I tasted the Bryant Cabernets with Bettina Bryant and Mark Gagnon at Bryant Family Vineyard in March.